With June being Winter Wellness month, what better way to celebrate health and vitality on a cold night than with a hot and filling veggie soup. Packed with flavour, colour and any vegetable in season you can think of, it’s a delicious meal on it’s own, but I decided to slow-cook gravy beef separately and then shred it and add the shredded meat on top of the soup. Stirred through the soup works just as well, but I liked the presentation of the succulent meat shredded on the top of the soup. I suppose this could be classed more as a broth than a soup, given the translucent nature of the liquid, but you can always process it if you prefer a thicker, chunkier soup. Also a good way to clear out the fridge of veggies that have perhaps been sitting looking at you waiting their turn for a few days, but with the addition of parsnips, swede, celery, carrots, onion, garlic, kumara, courgettes, it’s packed full of goodness to keep those Winter colds at bay. Yesterday our kid’s soccer team had to play in a torrential downpour again. I was so hoping that the fixtures would be cancelled and one of the parents actually commented that they are little children, not the world’s highest paid football players, but if one decides not to play, it impacts the rest of the team. So you stand on the side lines in gumboots and under an umbrella, braving the cold and wet while your darling runs around, freezing cold and soaked through, in the rain. I was very glad I had a steaming bowl of this at home ready and waiting. I suggest washing, peeling and dicing all veggies prior to beginning to cooking. 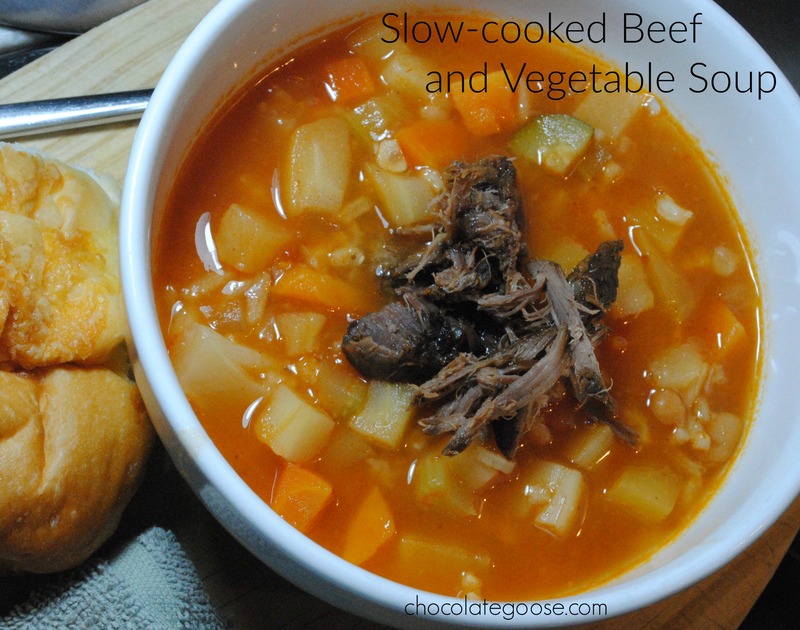 But if you do decide to add the slow-cooked meat, it will need to be placed into your slow-cooker 3 – 8 hours prior to you serving the soup. 3 hours on High, 6 hours on Medium or about 8 on Low. Nice if you need to put this on to cook before you leave for work in the morning. Just remember to add a cup or two of liquid so it isn’t cooking dry. Double the recipe and freeze half for another day. Wash, peel and dice all vegetables. In a large pot, heat the oil and gently fry the onion until soft and translucent. Add the garlic and celery and fry for a few more minutes. Add all other vegetables and fry for a couple more minutes, then pour in the stock. Season and allow to come to the boil. Once boiling, turn down the heat and leave to simmer until the vegetables are cooked through, around 20 – 30 minutes depending on how much you’re making. A few minutes before you’re ready to serve, add the cold leftover rice. It adds a little more texture to the now soft veggies and makes it more filling as a main meal. Taste it to check the seasoning as you might want to add a little more. Lastly, remove the meat from the slow-cooker and shred with two forks. It should fall apart and can be sprinkled onto the top of each filled serving bowl. Serve with crusty bread or cheese rolls on the side.